By the 1880s West 23rd Street from Fifth to Eighth Avenue was the center of Manhattan’s entertainment district. The thoroughfare was dotted with music halls and theaters between Fifth and Eighth Avenues. Some were quite grand like the white marble Grand Opera House on the northwest corner of Eighth Avenue and Booth’s Shakespearean Theatre at the southeast corner of Sixth Avenue; others were noisier and more robust like Koster & Bial’s Music Hall. The commodious brick and brownstone homes that lined the street at the time of the Civil War had by now been either razed or converted for business purposes. No. 240 West 23rd Street, once the four-story home of a wealthy and respected physician, was now the Hotel Byron. In 1895 the Vegetarian Restaurant No. 1 opened in the hotel, much to the delight of those following the trendy movement. But as the 20th century neared, the theaters and music halls began moving northward to Longacre Square—later renamed Times Square. In their place came loft and office buildings. Prominent among the real estate operators in the Chelsea area was the Cushman family. They traced their American roots to Robert Cushman who landed in Plymouth on the Fortune in 1621. It was Don Alonzo Cushman who began the family tradition of real estate when he erected rows of speculative, high-end homes in the 1830s on what had been the family estate of Clement Clarke Moore. On June 24, 1898 The New York Times reported that Joseph W. Cushman had purchased the two “four-story business buildings” at Nos. 240 and 242 West 23rd Street. Plans for a seven-story “brick store” were soon filed by the 37-year old architect C. P. H. Gilbert. The resultant building would be much more than a brick store. Gilbert adorned the façade with surprising decorative elements that were at the same time grand and playful. Garlands and festoons, along with reserved engaged columns within the openings were typical of the period. But grimacing demon faces along the top cornice, grinning bearded men above the sixth floor, and the show-stopping Renaissance-inspired piers at the second floor with handsome full-relief rams heads took the building well beyond the ordinary. Joseph W. Cushman and his brother, James Stewart Cushman, moved their two businesses into the building. Not only did they operate the J. W. Cushman & Co real estate firm; but they were principals in the Cushman & Denison Mfg. 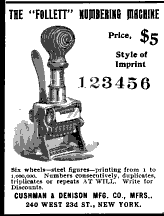 Co., makers of office equipment like rubber stamps and numbering machines. Cushman’s other initial tenants were A. P. Babcock’s perfume factory on the fifth floor; and the Automatic Vending Company on the fourth. On July 18, 1900 the other floors of the recently-completed building were still unleased. The manufacture of perfume required highly volatile ingredients and they nearly caused the destruction of the new building that night. The last of the Babcock workmen were cleaning up at the end of the workday, at around 5:40, when there was a small explosion. The panicked men ran out of the building. Captain Coleman of Truck No. 12 was on the fourth floor with 15 other firemen. They had just about extinguished the fire on this floor when a massive explosion occurred on the Babcock floor. The blast blew out the ceiling above them and the force slammed shut all of the fourth floor doors, trapping the heat and dense smoke in around the "dazed" firefighters. The blaze was extinguished within an hour; but the fourth floor was wrecked. Estimates of the damages to Cushman’s new building were around $20,000—nearly $600,000 in 2015 dollars. Repairs were made and, once again, lofts were rented. The two Cushman companies remained in the building for years as a broad mix of tenants moved in. The Cambridge Encyclopedia Co. was here by 1902, publishing educational books like A History of the Precious Metals, and The Middle Ages Revisited. Another garment firm, La Mode Garment Co. leased the third floor in 1912. By now the Cushman real estate firm had changed its name to the Allerton Realty Company. Two other apparel manufacturers, K. & M. Garment Company and Max H. Rubinstein, maker of dresses, were in the building by 1915. That year another devastating fire would nearly destroy the building. No. 240 West 23rd Street was separated from the Chelsea Hotel by the Third Protestant Reformed Church. Despite a heavy rainfall on the night of May 21, several guests on the upper floors of the hotel saw flames on the upper floors of No. 240. The night clerk, H. E. Hayes, left the desk to investigate. When he looked out an upper floor window “he saw across the church roof a lively blaze underway.” Both the K. & M. Garment Company and the Rubinstein factory were on fire. The Chelsea Hotel guests crowded onto the iron balconies in the pouring rain to watch the spectacle. The Sun happily reported that the “high pressure apparatus soon made short work of the fire.” Nevertheless damages amounted to about $6,500. The Chelsea Neighborhood Association had been in the building for at least seven years in 1917. Its purpose was to promote “the social, civic, and economic improvement of the Chelsea neighborhood.” Soon its focus would be on finding jobs for Chelsea residents. With the United States’ entry into the war in Europe in 1917 the nation found itself with a depleted workforce as thousands of men left for battle. The Government opened a branch office of the U. S. Employment Service office in No. 240 West 23rd Street, which worked in cooperation with the Chelsea Neighborhood Association. By 1918 the need for unskilled workers was critical. The New-York Tribune reported on August 8 that year, “The government wants 3,000 unskilled workmen at once for employment by the Edgewood Arsenal…near Baltimore.” Readers were directed to the West 23rd Street office for applications. Following the end of the war, activities in No. 240 West 23rd Street returned to normal. In 1919 the Combination Soda Fixture Corporation took the ground floor store space; while upstairs the United Toilet Goods Co. moved in. By 1937 the building was home to the Ansley Radio Corporation, headed by Arthur C. Ansley. The firm manufactured and sold electric phonographs and radios. Their combination radio-phonograph, called the Dynaphone, was a rather major piece of furniture. In 1939 they introduced the electronic piano, which also used the Dynaphone brand name. That year the company’s huge success resulted in its seeking larger quarters. In February 1939 it left No. 240 and moved to the Bronx. The Chelsea neighborhood saw tremendous change throughout the rest of the century; yet C. P. H. Gilbert’s wonderful façade survived. In February 1984 a conversion to cooperative apartments was completed, following designs of architect David Glatman. The resulting Arcadia contained 21 units including duplex and triplex apartments and studios. Glatman and his partner John R. Souto sensitively treated the exterior with a muted green paint on the spandrels and picked out the rams’ heads and faces in gold. Despite explosions and fires and decades of neighborhood change, the building looks much as it did when it opened in 1899.